A comprehensive sweep of the company’s internal systems unearthed a devastating calculation error on individuals requesting mortgage modifications between April 2010 and October 2015. According to Wells Fargo, 625 Wells Fargo clients were either incorrectly denied mortgage modifications or were not informed they could qualify to have their loans modified. In roughly 400 cases nation-wide, customers were foreclosed upon. In a brief statement on Monday, Wells Fargo said they were “very sorry this error occurred” and they are “providing remediation” to the affected homeowners. Though Wells Fargo had reserved nearly $8 million to reimburse those impacted by the mishap, the compensation offered is rather minute for homeowners who are currently battling the foreclosure process. For each one of the 625 homeowners, the total compensation is just $12,800 per homeowner, though the 400 homeowners who were ultimately foreclosed on may receive heftier payments than those who are able to keep their homes. Can I Reapply for a Loan Modification? If you are a Wells Fargo customer and you have been denied a loan modification, you may still qualify. Before reapplying for a modification, make sure your case is properly reviewed by a legal professional. Check with one of our New Jersey attorneys to see if you can qualify. Can I Get My House Back? It is possible to buy back your home after a foreclosure sale. The redemption process requests the homeowner to pay a certain amount for the home plus other fees. 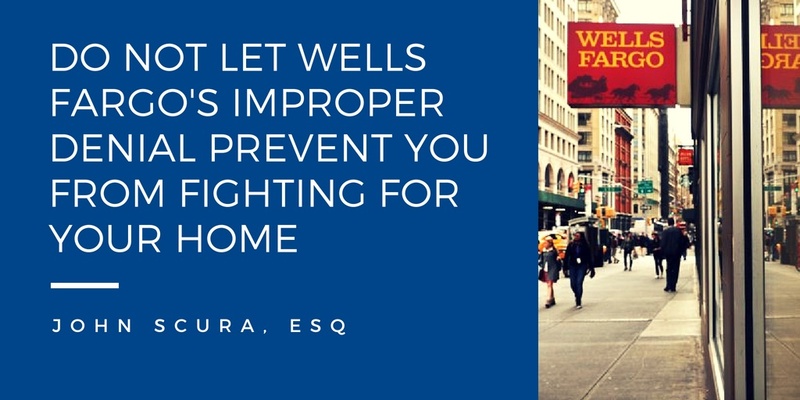 Do not let Wells Fargo’s improper denial prevent you from fighting for your home. For those who may be able to take advantage of one last opportunity, consult with our experienced attorneys to find out what your options are.